Hey all, I have a blue prelude and I'm looking for some rims but I'm really undecided with what color or wheels I want. I'm mostly thinking bronze/gold or gunmetal. 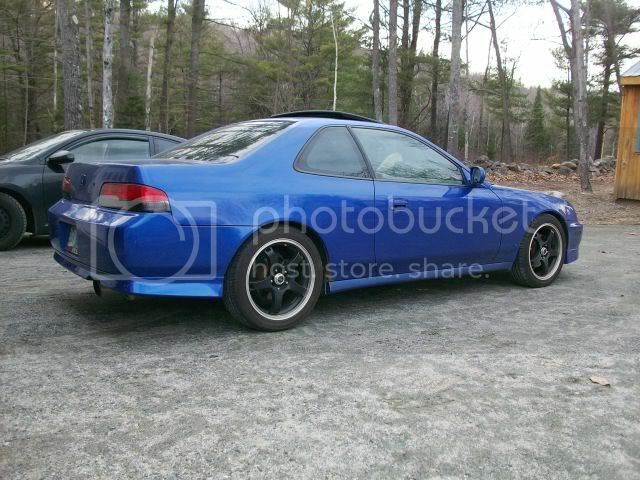 Ive been looking online but I cant really find any blue preludes with rims so if you have pics post em. I'm open to anything even white so please guys help me out!! The gold looks sick as hell on there. I am on the opposite end of the spectrum. I say go with either the bronze, gold, or white. I hate seeing black rims on a blue car. I have the exact same color as you and will never consider buying black rims. Even though the lighter colors show dirt easier, they make the car look cleaner. For white, I suggest either a set of SSRs or Volk TE37s. If you are going gold/bronze, Volk CE28 or some Yokohama Advan model 5s. If you want to be different, there is brand called Dymag, that makes a wheel that is carbon fiber and magnesium. You can get their wheels in either gold or white, or even black. dymag.com. It all depends on how many spokes you want, and how big you want them to be. Thanks everyone for commenting. First off I really dont want to spend 500$ a wheel. I mean if I was tracking the car or keeping it forever then i would have no problem but this is my daily driver so I'm thinking something a little less expensive. So unless there is a really sick deal i dont think ill be getting ssr or volks. why not just keep the rims u have, since its a DD, and you don't plan on keeping it. I like the ones you already have. Looks like someone is a Honda Head! Nice NSX man. As for the rims, gold would look better than bronze IMO, but those 5 spoke ones would look nice on the EBP. i like them too i just find its too stock, i thought about painting them but then i read a couple articles about how people find it looks really cheap and i can never find an answer on how long it lasts. yea i looked it up, i have the paint and sand paper I was going to do it this weekend but got called into work at the last second so i didnt get to do it. thanks (about the nsx) I was looking at both bronze and gold and i see a lot of blue rsxs on the forum with bronze so i figured it would work with my car but then i realized that they're blue is darker then mine so now im confused with what i should do, you have any rims in mind?? Last edited by LUDEZILLA; 06-02-2009 at 11:23 PM.